Mabatho Thobejane graduated with a BCom in Finance and Economics at the University of Cape Town and followed it up with a BA Honours degree in Curatorship from the Centre for Curating the Archive at the University of Cape Town. Her research interests include the affective impacts of exhibitions and how exhibitions can be spaces that facilitate important conversations and challenge existing hegemonies. Thobejane’s Honours thesis topic - titled Curation for Activism and Healing: Choosing the Margin as a Space of Radical Openness - explored the technologies of self that those who exist at the margins of society employ to not only survive the violence of the centre but also thrive in the face of it. 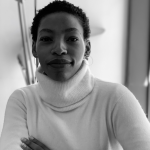 Thobejane was an assistant curator for the intercontinental engagement and project Conversations in Gondwana. Additionally, she has interned at the District Six Museum as part of their Young Curators Programme. During her time there she co-curated an exhibition - titled Memories [as] Matter - about the suitcase as a symbol of forced removals and displacement.